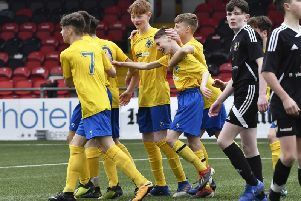 Warrenpoint Town manager Stephen McDonnell was delighted his game plan worked, as they easily seen off an out of form Institute. McDonnell watched his side cruise into a 3-0 lead just before the break and although they only scored once in the second half, they were always in control and ran out comfortable winners. “Overall I was pleased with the performance,” he insisted. “We planned slightly different, in fairness Institute have probably dominated most games of football they have been involved in terms of possession this year, so we had to respect that and we done that when we won up there in the (Irish) cup, so that’s twice now in three weeks that it has worked, we have scored six and conceded none against them, so that’s very, very pleasing. “It wasn’t probably our usual slick performance, but that wasn’t the plan today and there’s more than one way to skin a cat, so considering the plan worked and two striker’s scored a brace each, we’re delighted. “It’s the first time in a couple of weeks now that we went with a front four, in terms of wide men, an advanced midfielder and a striker, because we have been chopping and changing the systems to suit personnel and game plans, but we felt today that we could really hurt them on the break and be powerful and I felt we done that really well. Both Mark O’Sullivan and new signing Lee Duffy scored twice, as Town really took the game to Paddy McLaughlin’s side. As for ’Stute boss Paddy McLaughlin he held his hands up and conceded the home side ran out deserved victors but also conceded the Michael McCrudden’s transfer saga is distracting everyone at the club and needs to be resolved sooner rather than later. “It wasn’t was good enough and first half it was as poor as it has been for a long time,” he insisted. “That’s what happens whenever you drop your standards that far, you get punished badly and that’s what Warrenpoint done, so you have to give them full credit. “Michael’s situation has to be sorted the sooner the better because it’s a distraction right across the board, right throughout the club. “Me as a manager and I’m sure the players too are sick answering the questions about what’s going on. To be honest no one really knows because I’m the manager of the club and I don’t know what’s going on, so whatever is happening I hope it’s resolved fairly soon. “If he stays good, then we’ll get him back into the fold. He comes back from suspension for next week’s game against Crusaders, but if he goes then we’ll have to wish him all the best, but one way or the other it has to be resolved fairly soon. “I would like it to be resolved before we play again, because you can’t keep going on and on about it.